Atrium II is located at the corner of Spring Garden Ave. and Doris Ave. Built in 1985, this building is from an earlier era when condominiums were larger. The building only offers two-bedroom residences, ranging in size from 1,680 to 1,900 square feet. It is 24 stories high and well designed. Its residents are active within the building, serving on and organizing committees and in the community. 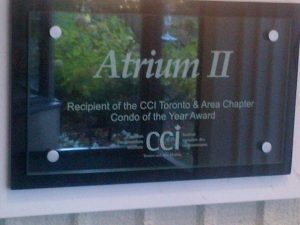 In 2009, Atrium II won the John Filion Award for Excellence. This was in recognition that, while many condominium boards try to create the quality of life that Atrium II has enjoyed, not many are successful. In 2012, it was selected as Condominium of the Year by the Canadian Condominium Institute – Toronto & Area Chapter. Atrium II is a diverse and multi-cultural community. Their fitness and aqua-fit classes are free to residents. Its Social Committee organizes activities such as movie nights, opera night, and games including Mah-Jong, bridge and poker. They also organize programs and celebrations for annual events that include Mother’s Day, Father’s Day, a summer BBQ, Halloween, a Warm Clothing Drive and a North York Harvest Food Bank drive. Culturally diverse, Atrium II celebrates religious events such as Christmas, Chanukah and the Chinese New Year. Each event can take weeks or months of planning and is controlled through their budget which allocates funds for each event. These are opportunities for people to socialize with neighbours, have fun, learn and contribute to their community. Their Communications Committee distributes a quarterly newsletter promoting internal events and activities. Other committees, all managed by residents, include Community Action, Property Standards, Finance, Building, Communication, Reserve Fund and Renovation. To ensure that committees are effective, each is chaired by a Board member. Its landscaping, which includes a Japanese garden with a stream, stone pagoda and Japanese Maple, is second to none. 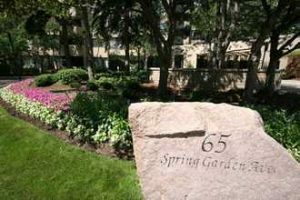 It won the North York Great Front Gardens Contest, an annual event run by the North York Horticultural Society recognizing outstanding front gardens that contribute to the beautification of North York. Atrium II is concerned about how rapid area growth is affecting the livability of the community. They played a key role in the formation of the Yonge Corridor Condominium Association (YCCA) which has and continues to make the voices of the Yonge North Corridor heard by all three levels of government. Some erroneously associate older condo buildings with high maintenance fees. Atrium II dispels that notion by providing value in the form of community and activities that residents appreciate. Condo buyers will wait for a unit to become available in this building rather than purchase in what they consider to be a lower quality building. Former residents are an illustrious group that include politicians (Eleanor Caplan, M.P. and former Minister of Health; and Thomas Wells, Provincial Legislature from 1963 to 1985), business executives (A.J. Billes, co-founder of Canadian Tire) and others who have made substantial contributions to the development of our city (such as Lou Ronson, a world-renowned human rights crusader; and both General Branwell Tillsley and General Maude Tillsley of the Salvation Army). As their Condominium of the Year award shows, Atrium II is not content to sit on its laurels. This condominium continues to improve as it attracts owners no less illustrious than those of its past. Atrium II is a model for how a condominium building can provide a superior lifestyle, an active social life and contribute to the local community.